As tokens of their mutual admiration, George Washington and Lafayette simultaneously commissioned portraits of each other from artist Charles Willson Peale in 1778 or 1779. Peale left the three-quarter length Lafayette portrait (now at Washington and Lee University) unfinished for almost a year, apparently reluctant to part with such an important subject. Before he sent the portrait to Mount Vernon, Peale painted a bust-length replica of it for the museum. The replica is included in the October 13, 1784 list of the museum's collections printed in the Freeman's Journal and Philadelphia Daily Advertiser. Listed in the 1795 Peale Museum catalog. Purchased by Captain William Wayne at the 1854 Peale Museum sale. Purchased by Albert Rosenthal for the City of Philadelphia from Wayne's granddaughter in 1903.
afayette was born on September 6, 1757 in Auvergne, France. He attended the Collège du Plessis and a military academy, in keeping with his aristocratic heritage. Seeking adventure, he joined the Continental Army in 1777. He funded his own ship for the transatlantic passage. In America, he served without pay and provided for his troops out of his own pocket. He fought at Brandywine and Gloucester, wintered at Valley Forge, and accompanied the Monmouth and then the southern campaigns, fighting at Yorktown, where the British surrendered. fter the Revolution, Lafayette encouraged the tenets of republicanism in his home country. He wrote the Declaration of the Rights of Men (which he equated with the Declaration of Independence) and presented it to the National Assembly. However, the combination of his aristocratic heritage and his republican politics made him suspect both to the growing revolutionary faction in France and to traditional monarchists. In 1792, he and his family were imprisoned (which probably saved them from the guillotine). They spent the next five years outside of France. 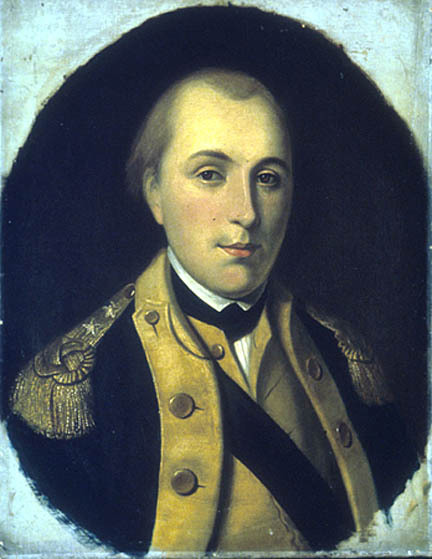 During Napoleon's reign in 1799, Lafayette secured his family's release. He retired to his home near Paris, where he continued to write in support of countries engaged in political reform. afayette returned to America in 1824 on the eve of the Revolution's 50th anniversary. He toured the U.S. for several months. He was hailed as the triumphant hero of the Revolution and the fond companion of Washington. In gratitude for his support during the Revolution, the U.S. government gave him $200,000 and a large tract of land in Florida. Returning to France, he spent the next decade speaking publicly about liberty. He died near Paris on May 20, 1834 and was buried under a mound of earth that he had brought to France from Bunker Hill.